Last night i got the Vulture Bases completed. 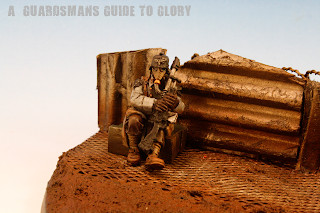 I tried hard make the atmosphere dark and gritty, as is befitting for the Krieg! 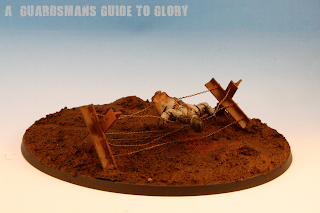 So i kept the colours dark and bleak, with the exception of the Kriegsmen themselves, as i wanted a little attention drawn to them. 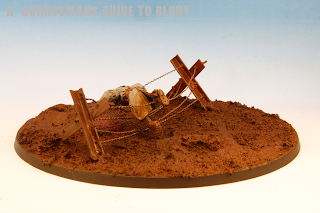 Here are the Vultures on the bases - not a great picture but they don't fit into the light box!! So with another two units complete, its on to the final four! I picked up two of them yesterday from Games Workshop in Carmarthen, and will probably get them built tonight in front of the TV (provided i dont start playing Assassins Creed: Brotherhood, which i also bought yesterday!)! Yes, its the humble Chimera! I'll need another two of them after these guys for the Armoured Fist Squads, as well as two Autocannon turrets from Forgeworld. When i place that order I'll also be getting a Taros as well! Reason being that for Blog Wars in June your list needs to include one Special Character. I wont give away anything else just yet, but my Special Character rolls around in a Taros! Its the character model for my Custodians that i mentioned a few posts ago. The cast is excellent, and I'm really looking forward to painting this guy! He'll have to wait until I've done the Armoured Regiment though, as its so close to completion! More busy modeling days ahead i think! Very nice indeed my friend great job on the bases. Do you still want to accept my offer, or have you decided the base might be to over crowded? I can't really tell from your photo if it would or not. I am looking forward to seeing your Chimera's done. I completed my Command Chimera on Friday with the extra bits that people had suggested. Im ganna take a pass on those extra Krieggy Boys, but thanks anyways! Once the flying stand is attached it does become quite crowded. I'll pop over to your blog in a mo' and check out your Chimera. I've just put the first one together now - the newer kits are so much better than the older ones, especially when it comes to putting on the tracks!! They are alot better but there is still room for improvement. I'm not so keen on them, as you don't get all the extra stuff like you did with the old one's. Like the track guards, guards man packs, oil drum and a few other things. I guess that's GW way of making money. What the new kits let you do is be able to build your own custom passanger crew compartment if you wanted too, with that detailed floor running all the way through now instead of the plain floor in the old kit. 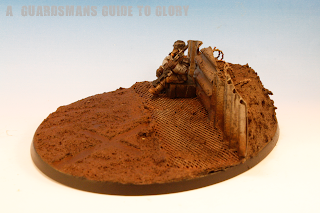 Great basing man, what do you use for that dirt?